access, purchase and maintain technological resources varies greatly. And often, in under-resourced schools where new technology is scarce, students may also lack access to internet and educational technology in their homes. A recent piece in the Huffington Post highlights this inequality, featuring an under-resourced school on Chicago’s SouthSide. Bronzeville Scholastic Institute, is one of three schools housed within DuSable High school, where more than 1000 students share only 24 computers. As the article further clarifies- the ratio of computer to students is not only horrendous, but insufficient funding for technology creates a digital divide beyond hardware. “Now, the bar has been raised, as newer software programs require high-speed connections and as WiFi-dependent devices such as iPads make their way into classrooms” . In the analysis that follows I would like you to keep the digital divide in mind, while I consider another issue. For those kids who have access to internet and ICTs at home and school, many still face the stigma of being called lazy, or unable to maintain concentration because of incessant technology use. Because ICTs come in so many different forms, from phones to tablets, to videos and media, kids are often using multiple sources at once. They are perceived as lacking focus or grounding. People who jump to these conclusions don’t always consider that skills like multi-tasking, decision-making, and coordination are being developed. This commonly held negative perception is another barrier to the expansion of ICT use in schools, and to re-thinking what we consider as valuable learning. While it is clear that youth who don’t have access to ICTs are at a disadvantage to compete with 21st century skills, many parents, schools and policy makers stifle the potential for kids who could have access to be creative and innovative with digital and media technologies (Stevens 2006). They still believe that too much technology will make their kids dumber, particularily online games and social media that is thought to erode social skills and intellectual growth. The Notebook, an online publication that acts as a watchdog for the Philadelphia Public Schools, answered these naysayers with an interesting piece in 2011that highlights some of the skills that are developed through digital technologies. There are also several projects that promote educational digital and media technology, including Digital Is, an initiative of the National Writing Project. These mediums can be harnessed in classrooms, so that kids can create and program websites or blogs, learning through music and video in addition to traditional text. Using digital media in student work can be done in small groups, incorporating project based learning models and building collaborative skills among learners. Even the widely demonized video game, has been shown to improve hand-eye coordination, planning and problem solving skills. Several open source websites like Gamestar, allow a place where youth don’t only play online games, but create them and share the products with each other. This work involves logic, design, coding, and strategy. The open-source nature of the website also nurtures a value for collective success and work—a skill becoming more and more popular in the working styles of leading companies like IBM and Google. 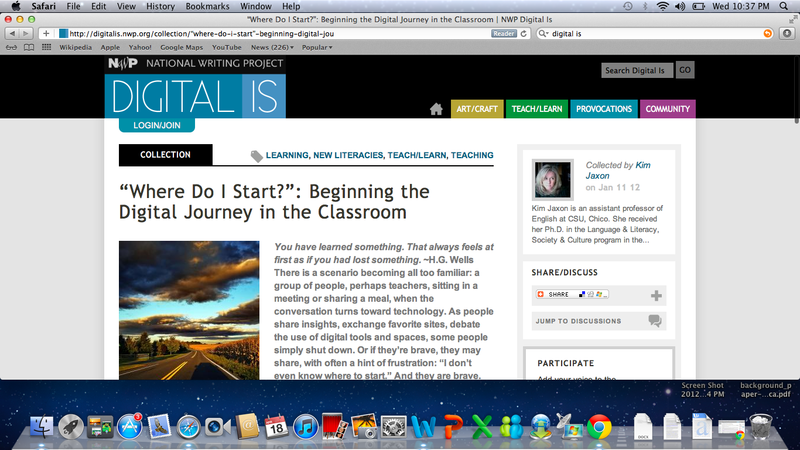 With all these awesome educational digital media initiatives you would think that everyone would get on board. But I will reiterate that opinions on the effects of technology on kids remain polarized, and many teachers and student do not support increased usage. I will leave you with the words of a middle school student “Get Moving; Don’t Get Lazy on Technology” This critique, oddly enough comes to us from a student journalism project called The Living Textbook, out of Unis Middle School in Michigan. While the author warns against youth using technology and getting lazy, he has collaborated with his classmates to create an interactive blog, his writing has a global reach through the internet and he is participating in new digital literacy practices. 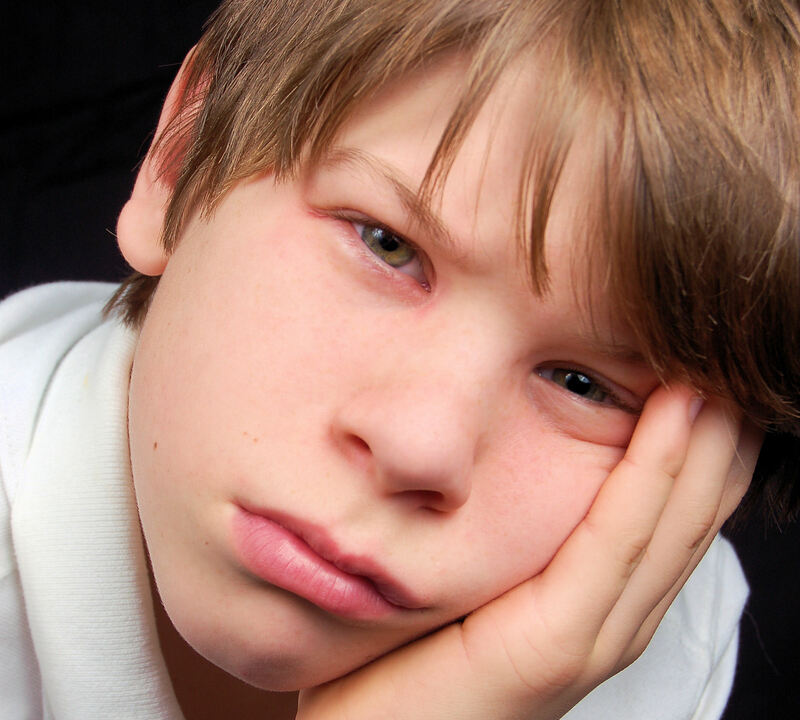 His opinion of course is his own, and is valid, but it may also be a reflection of the negative discourse that still surrounds kids using technology. In Naoko’s post, she writes about British school children, tired of traditional computing education. With all the potential for enjoyable learning through educational digital technologies, I would grow tired typing practice or learning how to print and save documents too! How does this relate to the digital divide? You might be asking “Anna, why did you lead us on this random tangent, just to show us a series of cool educational websites?” I see these realities as inter-related, and unfortunately, see eduring skepticism about educational technologies to be yet another hindrance for poor kids in under-resourced schools to gain access. School boards with stretched budgets might never choose to purchase new hardware, or expand broadband width, if they have more pressing needs and don’t perceive these tools as central to learning. Our recognition of the myriad ways in which technology can enhance learning for youth lags behind the rapid technological advancements, themselves. And even less promising, is our ability to tackle inequity in our schools. As the discourse begins to change and technology enters more and more schools, can we also demand an end to the digital divide? http://goo.gl/yaicG The Living Textbook. Student Online Journalism project, Unis Middle School. Stevens, L. P. (2006). Reconceptualizing adolescent literacy policy’s role: Productive ambiguity. In D. Alverman et al. Reconceptualizing the literacies in adolescent’s lives, (pp.297-309). NJ: Erlbaum. Whatever the criticisms of corporate-social responsibilities (CSR) activities may be –such as accusations that the parent company announces projects only for tax benefits or good publicity – a handful of CSR projects have had long-term positive impacts. The Intel Teach Program is one of these real successes. As this report in Reuters news agency says: “Intel Teach has enabled 10 million teachers” and “reached more than 300 million students”. Recent announcements of similar projects being initiated in South-east Asia evidence that Intel Teach must be understood as having an undeniable impact in formal education worldwide, and what future CSR projects can model themselves on. “Intel Celebrates 10 Million Teachers Trained”, a press release carried by Reuters News Agency on Sep 7, 2011, reports that the program had reached 10 million teachers trained in more than 70 countries, and by Intel’s estimates, reached 300 million students. The Intel Teach program is in its second decade of operations and aims is to train teachers to “effectively integrate technology into their lessons to promote problem solving, critical thinking, and collaboration skills” in students, “areas called 21st century skills by educators”. Intel CEO Paul Otellini says about the program: “We invest in teachers to that they inspire our students to be innovative, creative, and prepared with the critical thinking and problem-solving skills that are imperative to our future.” The focus on using technology in the classroom to facilitate critical thinking and problem-solving skills have struck a rich vein as program reports show that students were more motivated and showed more in-depth understanding. The program’s close collaborations with national, regional, and local education institutions and governments have been one of its mains strengths. In some places, this collaboration has made it the primary ICT training program in a country. As an example the article cites the case of Jordan, where teachers must complete the program to be “eligible for promotion and a 15 percent pay increase”. South-east Asia provides a great example of the current focus on connecting ICT concerns and tools with education programs like Intel Teach. As the article “A “smarter” through ICT” from 2009 reports, the National Electronic and Computer Technology Center (Nectec), a private sector actor, has drafted a four year plan to make the country’s people and government smarter by increasing access and utilizations of ICT. 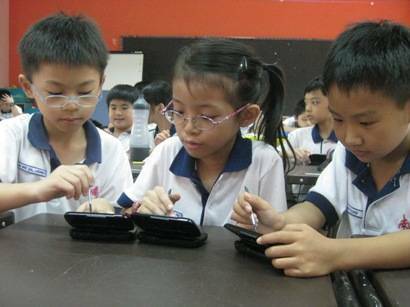 ICT interventions in education across South-east Asian region are not simply limited to providing Internet connectivity and curriculum changes. There is also attention to providing hardware, and funding for scholarships. Intel has promised to facilitate Vietnam’s e-learning initiatives by providing “one million affordable PCs” (the program is called Education PC and will focus on providing sturdy tablets rather than computers) and training to teachers. The face of literacy is taking new forms everyday with children and adults needing to use various media for performing different tasks. The new literacy practices only prove that literacy is fluid as it can be practiced across different media. Intel is a key player in helping to disseminate digital literacy in developing regions by training teachers in the modern forms of literacy. Their work in Vietnam and Cambodia will enable many children to learn digital literacy who may not be able to afford the education without the partnerships between their respective governments and Intel. While the Intel educational projects seem perfect at the moment, questions can be asked about the sustainability of such programs. Little or no discussion took place on how to make these ICT literacy drives endure, if/when Intel stops funding them. Perhaps the governments will be responsible for carrying on with these programs, perhaps they will not. I hope the respective governments and beneficiaries of the Intel Teach program start planning for the future sustainability of such positive endeavors now. P.S: Dear readers, although helping teachers and students in developing countries with computer literacy and training may be well accepted, educators and children from developed countries feel differently about ICTs in formal education. As they are already familiar with computers they sometimes feel that ICTs curricula are not teaching higher-level ICTs skills or making children lazy and dependent on ICTs. 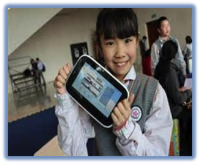 Naoko and Anna, two of our ICT4BOP bloggers will discuss these different perspectives on ICTs in formal education from the developed world this week.